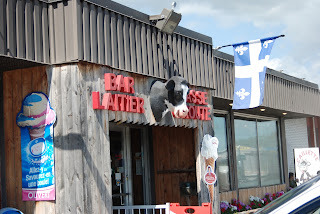 This week, I visited three fromageries while travelling the back roads between Quebec City and Montreal. Although the cities are fascinating, their hotels luxurious, and their restaurants marvelous, in many ways this was the highlight of the trip. 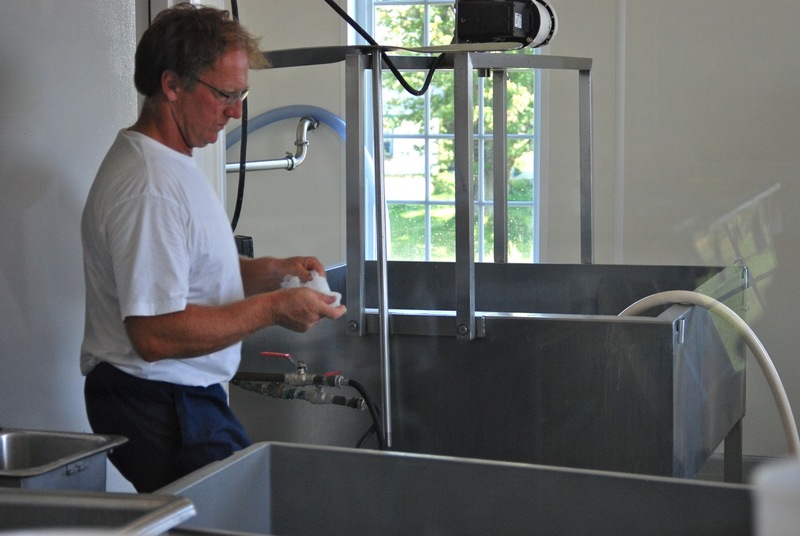 Quebec has some great cheesemakers, and is really moving forward with new and renewed facilities and government support of the industry. We found some terrific cheeses out in the country that I'd like to tell you about. I wasn't sure what we would find. 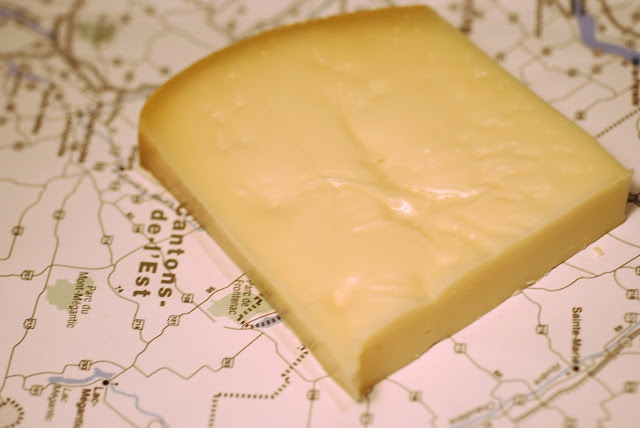 I had a 2008 map of the cheese route of Quebec, and a patient husband who drives fast, speaks some French and doesn't mind going into the Sept-Onze in some tiny, dusty ville to find out exactly where in town the Fromagerie might be. 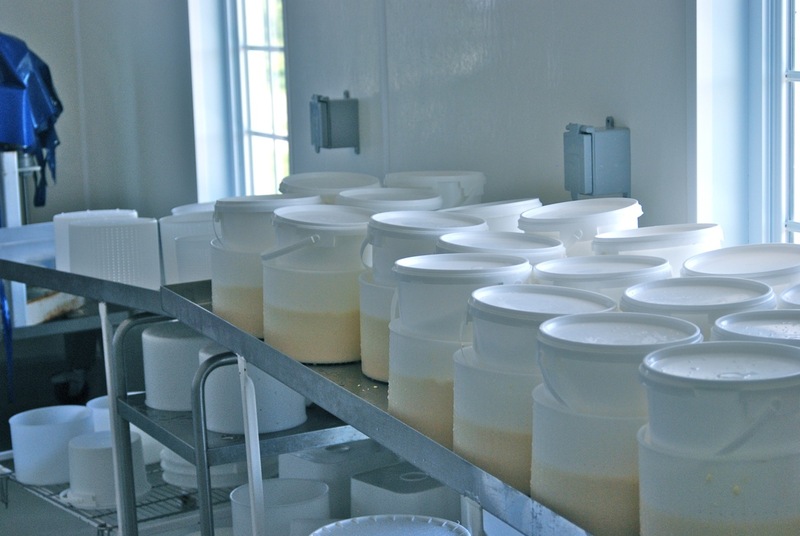 But the day turned out very well, yielding some top-notch cheeses and interesting experiences. First stop was the Fromagerie des Grondines, a very nice farm quite near the highway. 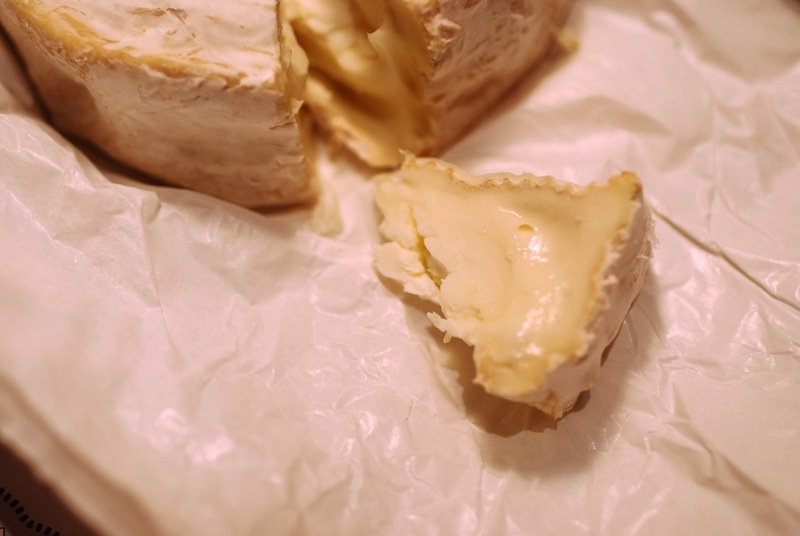 The proprietress was very helpful in describing the sheep, goat, and cow cheeses, as well as blends of sheep/goat and goat/cow cheese. They were all very good, and I bought a half-round of Mascaret, which is an aged sheep's milk tomme. This was lucky, because when we finally arrived at the Hotel Gault, we sliced into it. 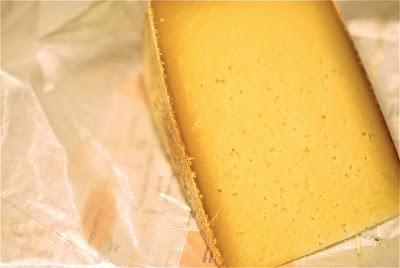 This cheese is fantastic: mature but not overwhelming, very firm and even in texture, and perfectly balanced. 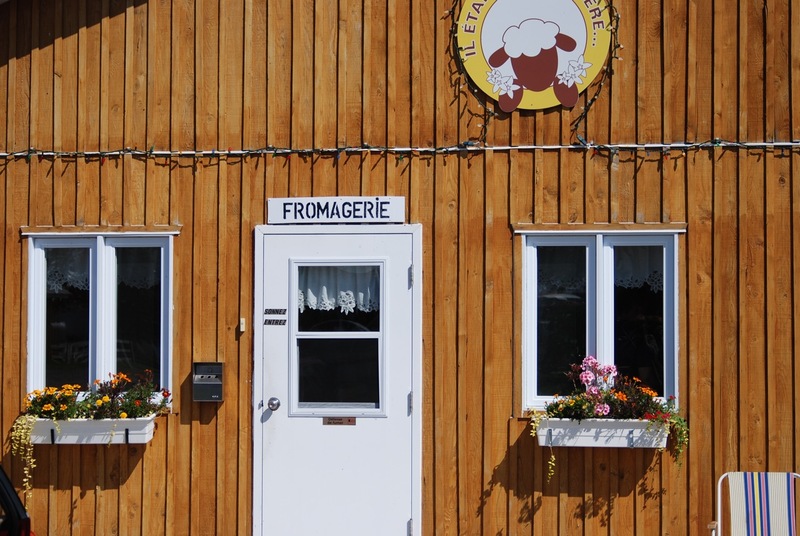 This fromagerie, established in 2006, is owned by Louis Arsenault, who is very active in the artisanal cheesemakers association. 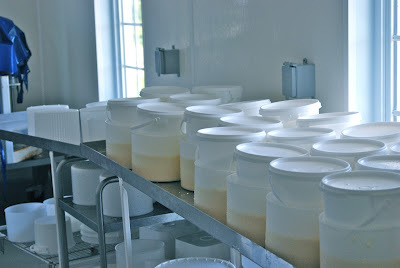 We were able to observe some of the cow/goat cheeses draining, only under about 2 kilos of pressure. 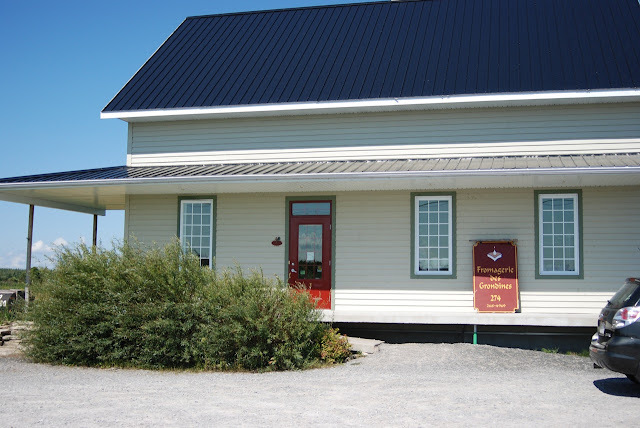 Southern Quebec (the St. Lawrence lowlands), is as flat as a pancake, and the corn fields go on forever. 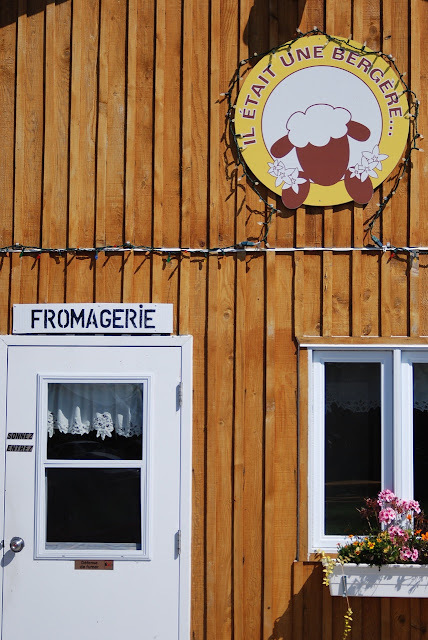 Little signs invite you to drive up fresh tractor ruts between corn rows, to buy maïs sucre. However, I never saw anyone eating it in a restaurant; it's extremely hard to eat sweet corn gracefully, and so I imagine that stylish Montrealers only do this in the privacy of their own maison. 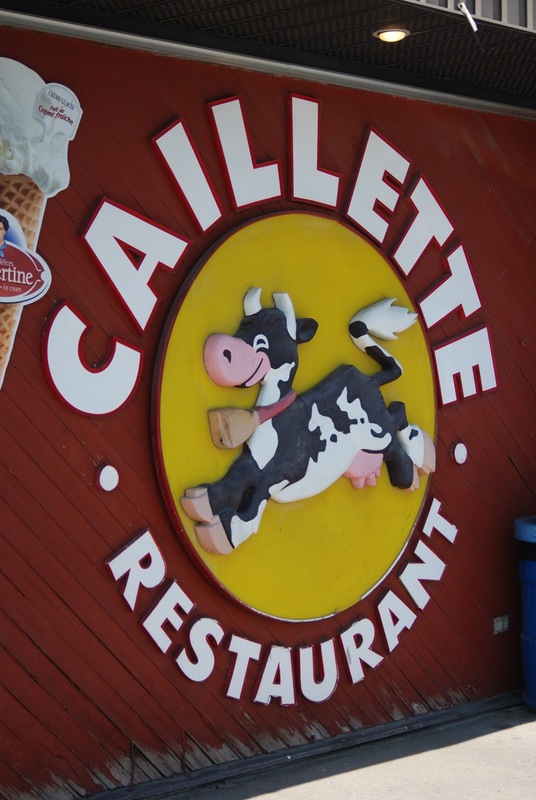 And speaking of pancakes, we stopped for a smoked meat sandwich (hold the poutine) on the way from Quebec City to Montreal, at Restaurant Caillette, in Maskinonge. There is a recipe on the side of the bag for "buckwheat cakes", which seemed to be quite different from our idea of a buckwheat pancake. There are no eggs, and they are thin pancakes, like crepes. Naturally, I can't wait to try them - I'll let you know. 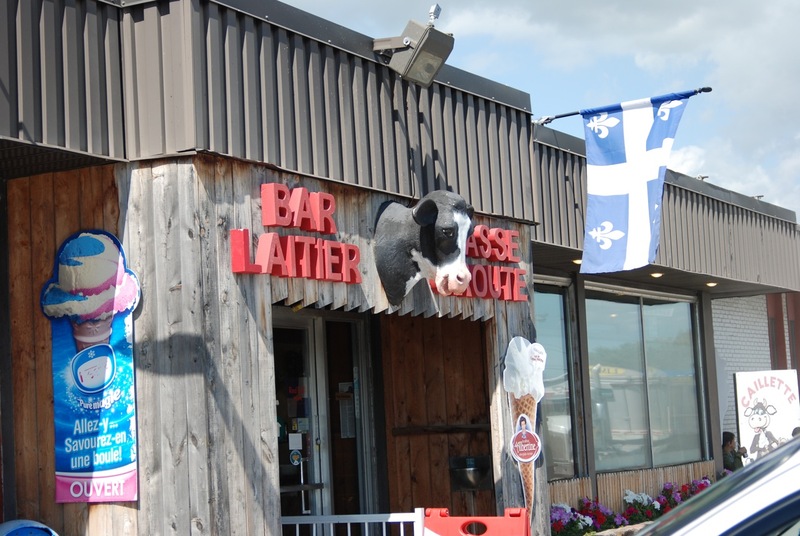 Next, we had a nice visit at Fromagerie FX Pichet, in Sainte-Anne-de-la-Pérade. 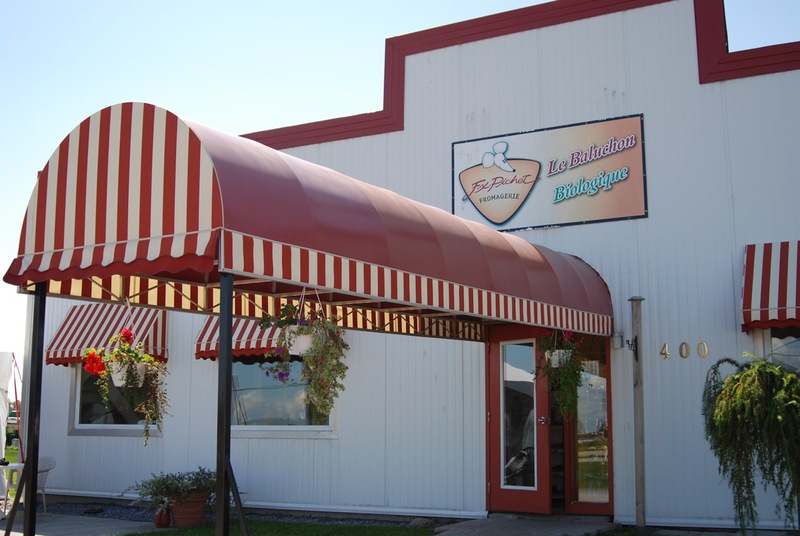 A family business, the young man explained, as he showed us their cheeses: Baluchon, an award-winning semi-firm cheese, Reserve la Perade, a hard cheese, Champlain, a Reblochon-type cheese, and Roy, a Parmesan-style cheese. 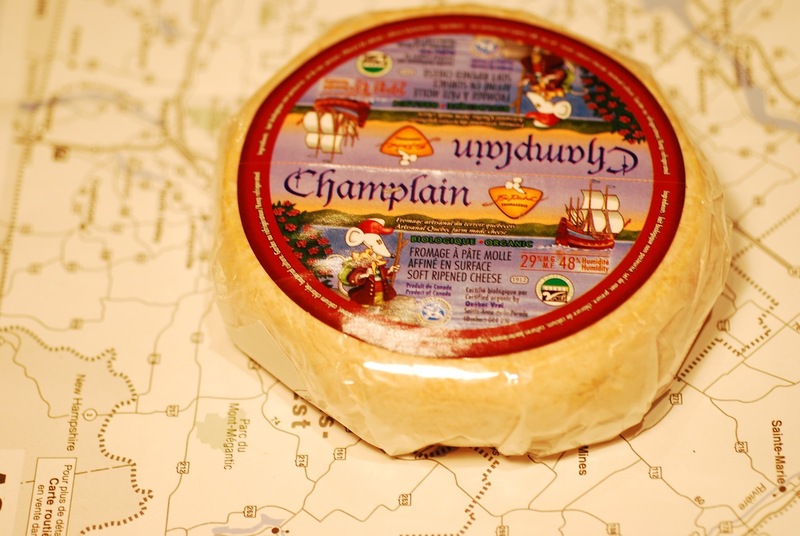 I liked them all, but the Champlain was a standout, and I bought a round. This is my other top pick from the trip; it's smooth, mellow and absolutely pleasant to eat. who looked after her sheep. 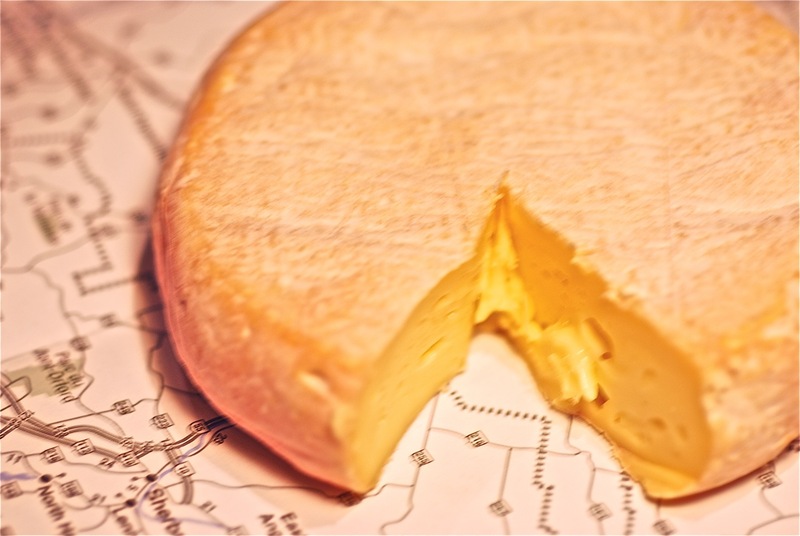 True to the name, the cheeses are all sheep's milk. 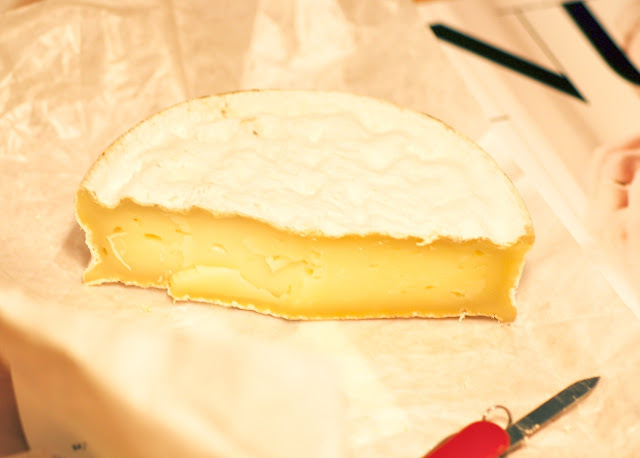 We were greeted by a charming woman in a sparkling white uniform, who showed us the offerings. 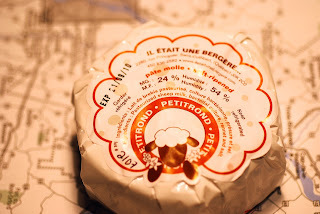 Although we could scarcely communicate, eventually I bought three: Douce Folie, PetitRond, and Petit Peche. First, Douce Folie, a mild, semi-firm, very smooth cheese, about the same consistency as mozzarella. This didn't last long once we got home, baked some bread, and layered this cheese with ripe tomatoes and basil from the garden. 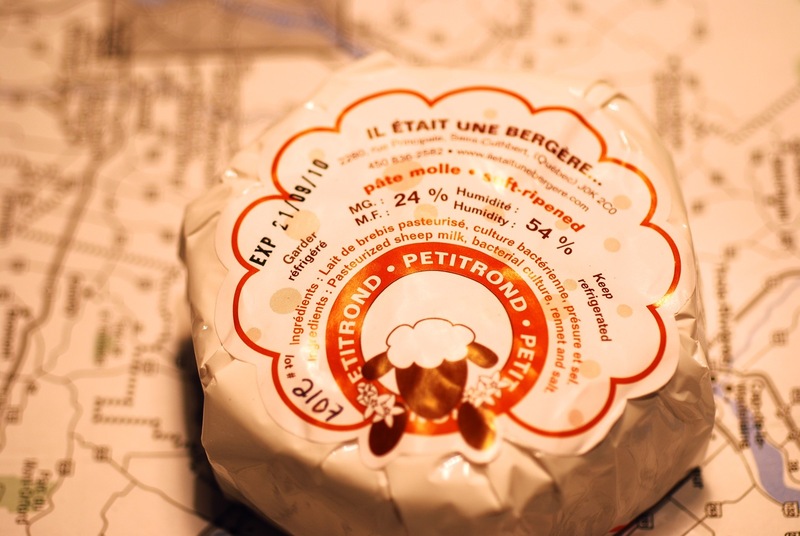 The PetitRond is a bloomy-rind, extremely mild cheese, quite young. 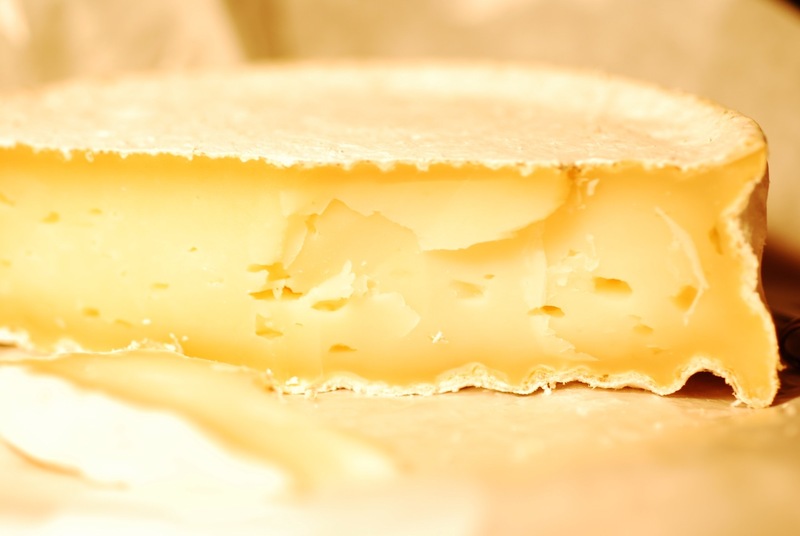 This cheese would be a rich backdrop for stronger flavors, like bacon or fruit. 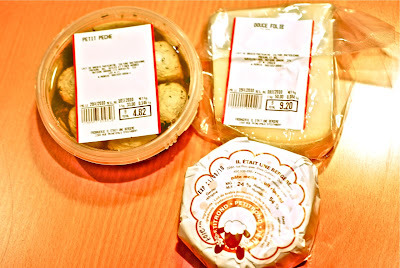 Lastly, I bought the tantalizing "Petit Peche", little balls of fresh cheese in oil with herbs. I'm not sure whether the name means "little peaches" or "little sins". It depends on the accents and whatnot, which aren't shown on the label's typeface. Canadians just know these things. 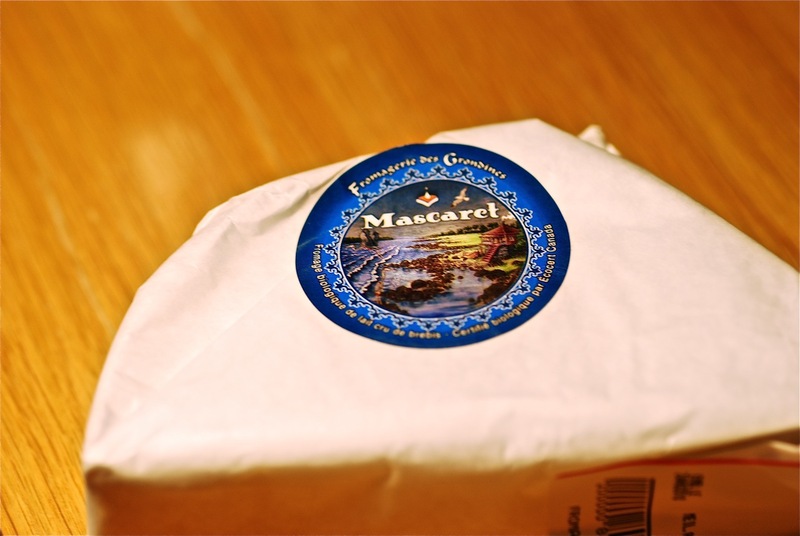 These are available from several fromageries, flavored with everything from sundried tomatoes to vanilla. I'm opening them tomorrow, and we'll see if they live up to expectations.